Largest church in the union of Parishes. The organ was originally built in 1912 by George Benson of Manchester, and was installed at Tourmakeady Parish Church, Co. Mayo, where it remained in use until the church closed for worship in the early 1950s. 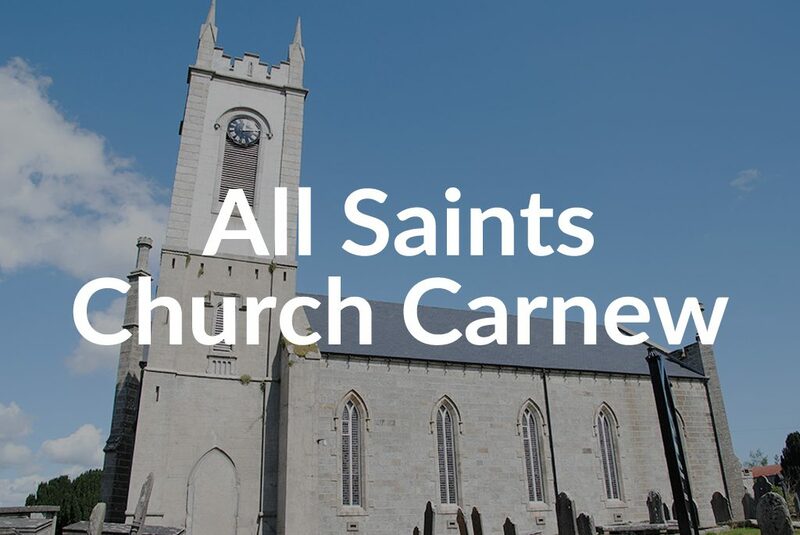 It was moved from Tourmakeady and subseqently re-installed in All Saints, Carnew, in 1956 by R. E. Meates and Son of Dublin. In addition to Upper Primary school Rev. Moore left two other monuments to his memory. In the 1840’s he built All Saints Church to replace the church built by the Nicksons in the 1720’s. The clock tower and the spire which had been added to the old church in the early 19th century were left standing. He also built the twelve foot high castle wall, thus shrouding from the public gaze the old grey dense castle walls which re-echo so many tragic chapters in the history of the town of Carnew. All Saints Church was built in 1847 of granite and celebrated its 150th anniversary in 1997. Up to mid-1800s, the graveyard served all denominations. The graveyard wall was moved in the 20th century, and it is said that there are graves under the footpath. The organ in the church was built in 1912 for Tourmakeady church in Co. Mayo and was installed in All Saints in 1956. Interestingly, the Clock Tower precedes All Saints Church. The remains of the original church can be seen on the side of the tower. An electric movement replaced the mechanical clock in 1997. The original hands and dials and mechanism are still in situ.